The inshore fishing is really picking up; the last two weeks have been very good inshore! We are catching Redfish on fresh bait as well as artificial lures. The best bait lately has been fresh cut menhaden and small live menhaden. Using carolina rigs with 1/0 EC L42 hooks and forty pound Berkley Big Game mono leader. A 1/2oz to 1oz egg sinkers is doing the trick for weight on the carolina rig. Fishing in the ICW, creeks and on docks with carolina rigs for deeper water Redfish has been a good trend lately. When fishing with live bait for Redfish in shallow water we are using Saltwater Assassin Kwik-Cork with twelve to sixteen inches of forty pound Berkley BG mono leader and a 1/0 EC L42 hook. When we are casting artificial’s for the Redfish we are using a few different kinds of baits. In deeper waters scented grubs have done very well; Berkley Gulp and Powerbait have been the favorite. Gulp 3” shrimp and 2” peeler crabs on 1/4oz to 3/8oz red jig heads with a thirty pound Stern tinted Fluorocarbon leader (gunsmoke). We use the same setup for the Powerbait in shrimp and jerkshad patterns as the Gulp grubs. The swallow water artificial bite is really picking up; casting lures in one to three foot of water. MirrOlure’s Top Dog Jr and Top Pup in colors 11(red head/white body) and 808 (black/gold/orange) have been the choice top waters for us. When the sun is high and the sky is clear we cast spinner baits in shallow waters; we prefer gold spoon and new penny grubs on our spinner baits. Sheephead fishing is starting to pick up as well around the area. The best bet is fishing around bridges, docks and bulk-heads. Fishing in water from six to fifth-teen feet for Sheephead seems to work the best for us. We fish mostly using small Carolina rigs, with forty pound mono leader and small but strong live bait hooks. Baits we are using; fiddler crabs and sand fleas have worked just fine. Give it a shot, it takes time but you’ll get one; Hold-on tight! We have also caught a hand full of very nice Blackdrum while Sheephead fishing. Flounder fishing is really picking up around the area. Most of the Flounder are eating little menhaden and Mud minnows on light Carolina rigs. The Flounder are mixed in size to just under keeper size to a few over five pounds. We have caught some Flounder on Artificial baits as well. We have had the best luck with Berkley Gulp 3” pogy in pearl white and smelt colors. Rig the grubs on a red or black jig head for best results. Flounder fishing should stay consistent right through the summer and fall. 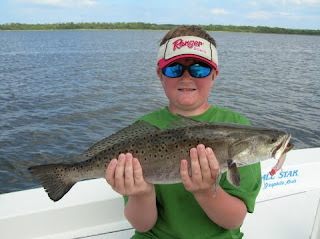 We have started to catch a few very nice Speckled trout lately, summer Specks are not always easy to catch. The great thing about summer trout is they love to hit top water lures as well as grubs! This last week we had one over five pounds and few others in the two to three pound range. Casting topwater’s like the Top Dog Jr and She Dog early in the morning and late afternoon have produced some nice Trout. When we are not using topwaters, Powerbait shrimp grubs and 17MR’s are working well. Just remember Trout have very eyes, always use a fluorocarbon leader when Trout fishing. We prefer twenty pound Stren tinted Fluorocarbon leader material in tannic for brown/river colored waters and gumsmoke for clear water conditions. Last but never lest; Cobia are starting to show up around the area waters. We look for Cobia around inlets, shoals and bait schools; near shore/offshore reefs and ledges are also a good place to look too. With the water being so clear it has been easier to see those brown logs in the water. We are throwing big jigs, swim baits and live bait to the Cobia. Color really does not seem to matter; “go bright”! When I’m not sight casting for them, we are fishing around inlets, shoals and near shore artificial reefs. We float fish, bottom fish and kite fish in these areas with live menhaden, blues and mullet as bait. You can chum if you like, but the sharks will come and they will come in numbers! Reels Penn Conquer and Sargus spinning in sizes 2000 and 4000. Spiderwire Ultra-cast braid in 10 and 15#. Rods: Ugly stick lite 6’6” and 7’ Med & Med-Heavy and the All Star ASR spinning rod ASR844S and ASR845S. Cobia: Spinning setup Penn Conquer 7000 with an Ugly Stick Tiger lite Jigging rod 6’ 6” and Penn 320LD Reel and a Tiger lite jigging rod.